Just in case Americans want to resist the New World Order. Predator B is powered by a turboprop engine and can carry a greatly increased payload. 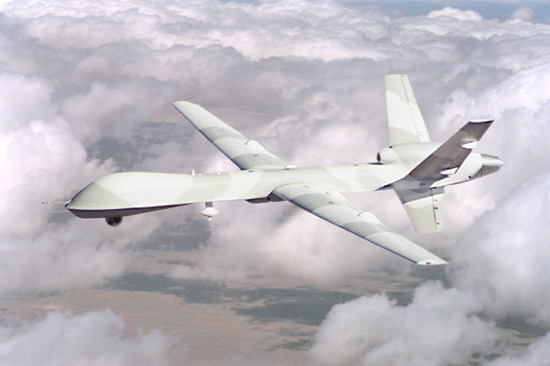 WASHINGTON (AP) — Unmanned aircraft have proved their usefulness and reliability in the war zones of Afghanistan and Iraq. Now the pressure’s on to allow them in the skies over the United States. The obvious risks have not deterred the civilian demand for pilotless planes. Tornado researchers want to send them into storms to gather data. Energy companies want to use them to monitor pipelines. State police hope to send them up to capture images of speeding cars’ license plates. Local police envision using them to track fleeing suspects. The Predator B, already in use for border patrol, can fly for 20 hours without refueling, compared with a helicopter’s average flight time of just over two hours. Homeland Security wants to expand their use along the borders of Mexico and Canada, and along coastlines for spotting smugglers of drugs and illegal aliens. The Coast Guard wants to use them for search and rescue. The National Transportation Safety Board held a forum in 2008 on safety concerns associated with pilotless aircraft after a Predator crashed in Arizona. The board concluded the ground operator remotely controlling the plane had inadvertently cut off the plane’s fuel. Homeland Security Secretary Janet Napolitano has told lawmakers that safety concerns are behind the delays. Cornyn is blocking a Senate confirmation vote on President Barack Obama’s nominee for the No. 2 FAA job, Michael Huerta, to keep the pressure on. Some concerns will be alleviated when the FAA moves from a radar-based air traffic control system to one based on GPS technology. Then, every aircraft will be able to advise controllers and other aircraft of their location continually. However, that’s a decade off.